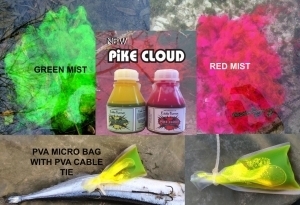 AFTER 2 YEARS OF TESTING WE FEEL CONFIDENT TO INTRODUCE........PIKE CLOUD! ITS A VISUAL ATTRACTOR WITH A SMELL. USE A PVA CABLE TIE TO SEAL IT ADD SOME OIL & EDIBLE GLITTER FOR EVEN BETTER EFFECT! A CLOUD OF FLAVOURED MIST!